The Chicago Pop Culture Convention starts this Saturday and runs through Sunday in St. Charles, IL. I'll be "On the Beat" as usual, looking for interesting celebrities, guests and friends. 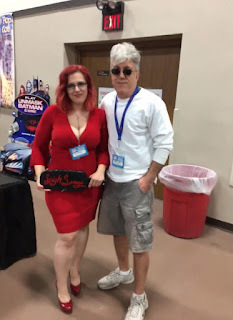 Leigh Savage is an author, podcaster, actress and more. She is also a spokeswomen of the #EroticaSpeaks campaign that is trying to bring all forms of Erotica into a more positive and empowering light. She is quite the busy woman. She was her usual busy self at last year's Chicago Pop Culture Con, too. With panels, signings etc, I kept missing my chance to get a picture with Leigh. I was about ready to leave, when Leigh turned a corner and I almost literally ran into her. I love happenstance. You can find out more about Leigh's books at GoodReads. They aren't your average books and they will certainly entertain you. You can also follow Leigh on Facebook. Go to ChicagoPopCultureCon.com for more info and schedules. I'll be "On the Beat" and hopefully, I'll see you there. Leigh Savage and me in St. Charles, IL-November 2017.